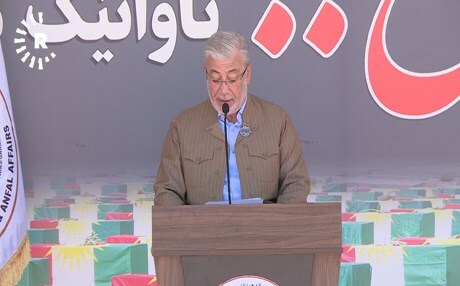 GARMIYAN, Kurdistan Region — Bashir Haddad, the second deputy of the speaker of the Iraqi parliament, expressed at an event to remember the victims of the Anfal Campaign that the events of the 1980s tried to eliminate the Kurdish nation’s identity. “This savage campaign by the Baathist regime was aimed at eliminating the Kurdish nation’s identity and destroying the identity of the territory of Kurdistan,” Haddad, a Turkmen, said on Sunday. Speaking in Garmiyan at the Anfal Memorial Monument, Haddad expressed that even now people should feel shame for the events. “Today, humanity’s conscience feels ashamed toward this big crime committed against this nation,” he said. He was joined at the event by the deputy prime minister of the Kurdistan Region. “I call on the Kurdistan Regional Government, especially his Excellency Deputy Prime Minister Mr. Qubad Talabani, to have more coordination with the Iraqi government and we are prepared to strengthen these relations and achieve the remaining rights in Iraq,” Haddad added. Talabani shared an emotional poem on his Instagram account on Saturday. KRG Prime Minister Nechirvan Barzani renewed calls on Saturday for Anfal victims to receive compensation from Baghdad. Ceremonies are held each year on April 14 to mark the anniversary of Anfal throughout Kurdistan and the diaspora. The Anfal campaign took place over eight phases – beginning in 1986, reaching its peak in 1988 including the Halabja genocide that instantly killed 5,000 people and injured another 10,000. It culminated in the closing weeks of the Iran-Iraq war. Sunday marks 31 years since the conclusion of the slaughter, which killed more than 182,000 people. Anfal, the eighth sura in the Quran, was the codename used by the Baathist regime for the slaughter. Political dissent was not tolerated under the Baathists, and hundreds of thousands of Kurds and Shiites were disappeared — men, women and children were sent in freezer trucks, trash trucks, and other vehicles to southern deserts. Some were summarily executed, others smashed and buried alive. The KRG devotes a ministry to martyrs and Anfal because of repeated atrocities committed against the people of the Kurdistan Region. Baravan Hamdi, the deputy minister of the ministry, told Rudaw on Sunday. “Out of the 210,000 victims of the Kurdish genocide, including the 182,000 people who were kidnapped in the Anfal campaign, only bodies of 2,672 have been recovered in a number of mass graves,” he said. People in the Kurdistan Region bring to the ministry claims of their martyred. Some families receive the salaries of the deceased or missing or other benefits such as free education at private institutions. “Most mass graves containing Kurdish bodies are situated in … Samarra, Anbar and some other places in Iraq,” Hamdi added. Mass graves in the southern deserts of Iraq continue to be found 16 years after deposing Saddam Hussein. “There is no accurate number of mass graves. It’s said there are more or less than 151 mass graves. Some of the mass graves uncovered date back to a time before the relevant order was made [for Anfal]. That is why there are shortages in data,” he detailed.